This 30ft Panga Center Console powered by two Yamaha outboard motors fishes out of Tambor across from Puntarenas on the Gulf of Nicoya. 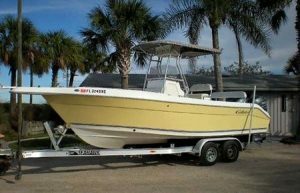 She is especially rigged for inshore fishing, but will travel offshore, and has experienced bilingual Captain Octavio (Tavo) Nuñez at the helm. Tavo will come across the bay to pick up clients staying in the Puntarenas/Barranca Caldera area, and also pick up cruise-liner passengers stopping in Puntarenas/Caldera for three-quarter day charters that include a full morning of fishing, lunch at Tortuga Island, some afternoon fishing, and then back to Puntarenas. On request, the boat will pick up at other nearby locations in the Tambor/Nicoya area.